I returned to ct from NYC at the beginning of the week after a great weekend building and tracking at the Bunker Studio in Williamsburg, ready to get back to work without the stress of grad school (which doesn’t start up for a couple more weeks). I spent Wednesday rearranging my schedule, and Thursday morning I was off! I stopped in to see Dave at Goff Professional to fix an issue with my Leslie. Not only did he fix a rattling driver, he tweaked the percussion, repaired a busted tone wheel, and cranked it up to about 13! He is the best! I was back on the road by 11:30. I had to stop at the Bunker to grab some gear I had forgotten, and then it was off to the club for sound check. 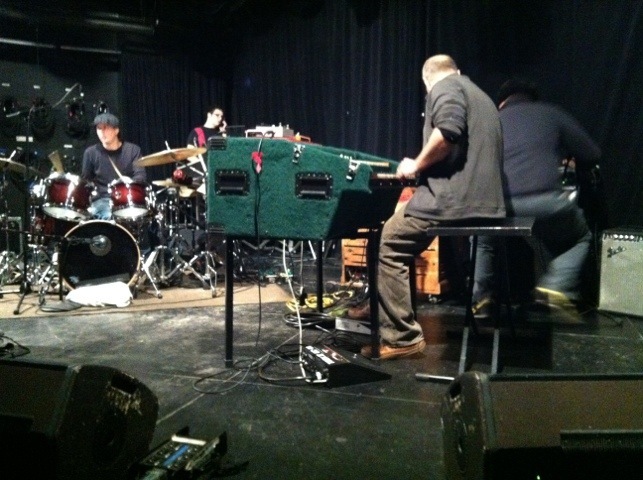 Medeski is a great guy and seemed to dig the organ and my collection of effects. It’s really great to get to sit back and hear someone of his caliber play my gear. We actually made the organ sound dirtier! Now I get a second to relax, enjoy some coffee from Grumpy, and head to BKLN for dinner with Evan before I need to head back for the gig. It isn’t until 12am, so I have some time. If anyone reads this and is around, you should head down to Le Poisson Rouge tonight!